You could be forgiven for walking past Razzo Coffee on St Andrew Square, thinking that it is not for you in your hunt for top-notch coffee. However, you would be mistaken. 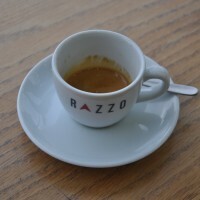 Razzo is that rarest of things, a specialist coffee shop with a passion for great coffee, but in a tourist-trap setting. For those who don’t know Edinburgh, St Andrew Square is at the east end of George Street, right in the centre of town. It’s the perfect place for tourists and shoppers alike to take the weight off their feet and enjoy a quick coffee or tea. At first glance, this is not where you’d expect to find excellent coffee, but Paul, the owner, is passionate about his coffee and has gone to great lengths to ensure that his customers get the best. As well as fine coffee to drink in or takeaway, there’s also tea, a range of sandwiches, Panini, cake and pastries, along with soup for a cold winters’ day. While I was there, there was a steady stream of customers, and, a very good sign, lots of regulars. So, next time you’re down that end of Edinburgh’s centre, don’t just walk past, pop in! Update: as of the end of June 2014, Razzo has had its lease terminated by its landlord and, within six days, was evicted, to be replaced by another coffee operation. I’ve always been struck by Paul’s passion for, and commitment to, top quality coffee and am shocked that a business can be treated like this. Sadly, this isn’t the first time I’ve heard of this happening and it’s real kick in the teeth for independent coffee and, indeed, for small business everywhere. How are you supposed to build a business if this can happen to you? July 2014: from what I’ve heard, although nothing is confirmed, it sadly seems that Razzo won’t be coming back to St Andrew Square. You can read my original post after the gallery. St Andrew Square is not the most promising location for top-notch coffee, but Razzo, which has occupied the café at the northeast corner of the square for a year now, is determined to challenge my (your?) preconceptions. Given the location, it would be easy to just put in an espresso machine, a run-of-the-mill grinder, buy some cheap beans and knock out coffee-chain quality lattes and Americanos to an undiscerning public. Instead, Razzo serves the sort of coffee that I’d found in the specialist coffee shops all over Edinburgh during my short, two-day tour. Paul, the owner, has the same sort of passion that I’d expect from those speciality shops, only in a very central location. And, at the end of the day, why not? Everyone deserves the opportunity to have great coffee if they want it. So to the coffee. Along with the two espresso machines, Razzo has a Clover machine, a rare beast in the UK, which is a high-tech, high-speed cross between a filter and a cafetiere. Paul explained that he wanted to offer something similar to a V60 or cafetiere, but with the majority of his customers wanting takeaway, he couldn’t afford to have them wait four or five minutes while their coffee brewed, hence the Clover. This takes about the same time as it takes to make an Americano, but it retains a lot more of the subtly of the coffee. I managed to sample an Extract Coffee (all the way from Bristol) through the Clover, Razzo’s guest coffee (Dear Green from Glasgow) as an espresso and a decaffeinated flat white. Of the three, I have to say that the flat white was my favourite, but this is all down to taste. The Dear Green is a very subtle coffee, while the Clover definitely highlights the Extract’s natural flavours. This entry was posted in Cake, Closed, Coffee Shops, Coffee Terraces, Edinburgh, Laptop Friendly, Lunch, Sandwiches by Brian Williams. Bookmark the permalink. Just noticed on twitter Razzo may be gone – replaced by something called Edinburgh Tea & Coffee Company..